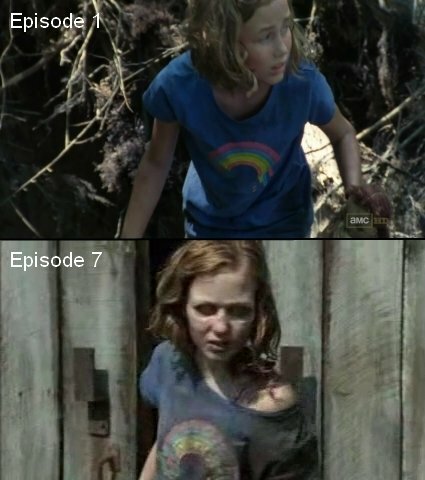 I kind of felt this is where the Sophia story arc was headed and told y'all it would be revealed before the mid-season break for THE WALKING DEAD. For now just take this as a rumor and read on if you dare but if you do check the image at the bottom! He finishes off the walker with a head shot, grabs a nearby pickaxe and breaks open the barn door. Walkers pour out, T-Dog, Daryl, Shane, Glenn, and Andrea form a line and open fire. Once the dust clears, one more walker emerges. Sophia. Rick finally steps up next to the others, pulls his six-shooter and kills Sophia with a shot to the head. End episode."